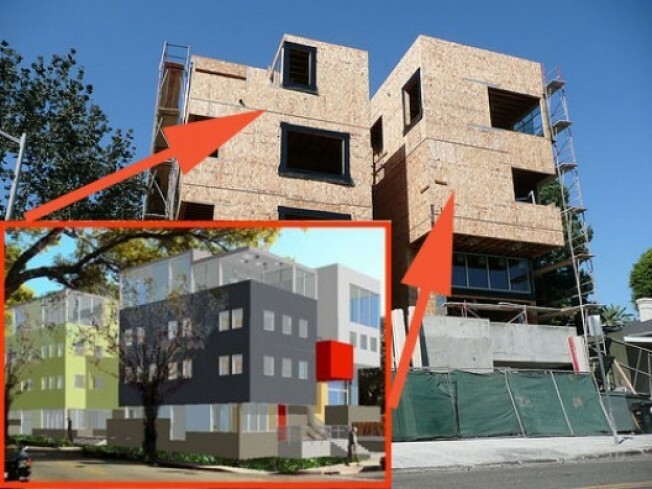 Just a speedy few blocks down from Habitat on the Park, here's a look at an under-construction project at Sweetzer and Norton in West Hollywood (and it's another one of those boutique-y developments cropping up around the neighborhood). According to the architect's web site, this will be 10 townhouse units. More on the project, currently being called Maisonettes on Sweetzer: "Articulated as three volumes organized around a central courtyard facing Sweetzer Avenue, all ten stacked townhouses interact with the courtyard, to foster a sense of community." No more details were available, but we hear the city has requested the colors be toned down a notch, so imagine these images a bit more muted.